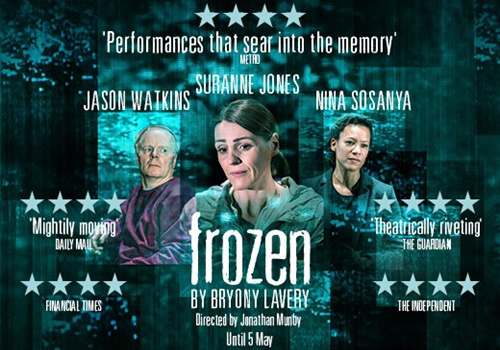 Suranne Jones stars in the highly anticipated revival of Bryony Lavery’s play Frozen at the Theatre Royal Haymarket. Originally premiering at the Birmingham Repertory Theatre in 1998, the psychosocial thriller has since been seen at the National Theatre in 2002 and on Broadway in 2004, earning a Tony Award nomination for Best Play. On a sunny evening, a girl goes to visit her Grandma. But she never arrives. Set in present day England, Frozen focuses on the search of missing 10-year old girl Rhona. Following three characters; the mother, a serial killer and a psychiatrist, the play explores the dramatic year after her disappearance. BAFTA Award-winning actress Suranne Jones stars as the mother, opposite Olivier Award-nominated actor Jason Watkins, who plays the kidnapper. Jones is best known for her portrayal of Gemma Foster in hit BBC series Doctor Foster, opposite Bertie Carvel. Further television credits include Scott & Bailey and Coronation Street, with stage credits including A Few Good Men at the Theatre Royal Haymarket and Beautiful Thing at the Arts Theatre. Jason Watkins is well-known for his various television appearances, including W1A, Being Human and Trollied, and has stage credits including A Servant to Two Masters at the Young Vic and Rafts and Dreams at the Royal Court. Further casting includes Nina Sosanya, who has appeared in W1A and Last Tango in Halifax. Frozen is directed by Jonathan Munby, who has credits to his name including Chichester Festival Theatre’s King Lear, starring Ian McKellen, Antony and Cleopatra, starring Eve Best, and The Merchant of Venice, with Jonathan Pryce, at Shakespeare’s Globe. Bryony Lavery’s additional plays include Beautiful Burnout and Last Easter. A gripping play about retribution, remorse and utter redemption, Frozen dissects the tangled lives of three strangers as they attempt to cope with the unimaginable. Playing a limited season at the Theatre Royal Haymarket, the production runs from February 9th to May 5th 2018, with an official opening on February 21st 2018. Frozen is recommended for 15+, due to disturbing themes.